Natural disasters, criminal activities or pandemic are among several events which can cause a panic within a populace. There have been a few rare incidents where the source documented to frighten the public was supernatural. In one such case over 100 years ago, the New Jersey Devil terrorized a state during what would be known as Phenomenal Week. According to legend, the Devil was born over 250 years ago and inhabits the Pine Barrens in the New Jersey State. During the 18th and 19th century, the creature was rarely seen or encountered while very few knew or even heard of the story. Between January 16-22, 1909, all that changed as newspapers at the time reported a week of massive sightings and confrontations with the Jersey Devil throughout the state. Beginning on Saturday January 16, 1909, the creature was first spotted flying around Woodbury, NJ and later in the day, in Bristol, PA, patrol office James Sackville shot at it with no effect. On Sunday, citizens in Burlingtion, White City and Gloucester, NJ founded unusual tracks within the snow believing made by the Devil. Over the next couple of days, sightings of creatures were reports throughout the state from cities such as Sedesboro and Gloucester,NJ. By Wednesday, as encounters with the Jersey Devil increased, accounts of it attacking household pets and live stock developed. Volunteer hunting parties formed up to find the creature which remain evasive. By Thursday, events escalated when the Jersey Devil reported to attacked a trolley car in Haddon Heights,NJ. This resulted in Trenton and New Brunswick,NJ placing armed guards upon trolleys, if the creature was to make future assaults. 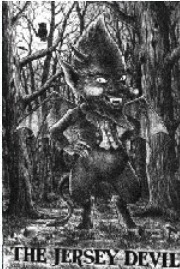 This one day was the height of reported sightings of the Jersey Devil from many cities within the state, along with a few from Pennsylvania. Even stories about poultry farms, where the creature was killing chickens, began to surface. On Friday, January, 23, 1909, as panic spread across New Jersey, several cities closed down schools, offices and business in fear of the Devil. As quickly as it began, the creature disappeared with the last official sighting made in Salem, NJ. During this period, the Philadelphia Zoo even posted a reward to anyone captures it which was never claimed. Over 100 years had passed since that week, giving the Jersey Devil its infamy today. This is one of the few documented cases within modern times where something paranormal sparked mass panic. Many heavily debate to what was actually seen. Theories offered range from a misidentified local animal, such as a snow crane or moose bat, to the supernatural, as it was an actual demon. Yet despite all that has occurred in the past, the sightings of Devil still continue on. Sanofsky, Josh. “Classic Cryptid: The Legend of the Jersey Devil. Who Forted. http://whofortedblog.com. This entry was posted in Cryptids and tagged Cryptids, Legends, Monster, Paranormal on March 30, 2016 by Gatekeeper.